The fossil record indicates that the divergence between the accipitrid and pandionid lineages took place before the Oligocene. Extant ospreys have a nearly global distribution, but all Paleogene fossils stem from Old World sites. The earliest specimen is an ungual phalanx from the late Eocene of England (Harrison and Walker 1976a). Although isolated ungual phalanges of birds can seldom be reliably identified, those of ospreys exhibit a characteristic derived morphology, which is related to their specialized mode of foraging, i.e., feet-first plunges into water bodies from considerable heights (Mayr 2006f). Harrison and Walker (1976a) referred the above-mentioned fossil to Palaeocircus, following Brunet's (1970) identification of Palaeocircus cuvieri Milne-Edwards, 1871 from the late Eocene Paris Gypsum as an osprey. However, P. cuvieri is only known from a carpometacarpus and there are thus no skeletal elements in common with the British specimen. Correct identification of P cuvieri as an osprey was further doubted by Olson (1985). An ungual phalanx of an osprey was described by Mayr (2006f) from the early Oligocene (Rupelian) of Germany. Rasmussen et al. (1987) reported a distal humerus and a tentatively referred incomplete carpometacarpus of a stem group representative of the Pandionidae from the early Oligocene of the Jebel Qatrani Formation in Egypt. The fossil record of the Accipitridae also dates back to the late Eocene/early Oligocene. The oldest representative may be Milvoides kempi Harrison and Walker, 1979 from the late Eocene of England, a species known from an incomplete distal tarsometatarsus, which resembles the corresponding bone of extant accipitrids (Harrison and Walker 1979b). Mayr and Smith (2002a) tentatively assigned a distal tarsometatarsus from the early Oligocene of Belgium to the Accipitridae. Two accipitrid species were further described from unknown localities and horizons of the Quercy fissure fillings: "Aquila" ("Aquilavus") hypogaea Milne-Edwards, 1892 is based on a femur, whereas the holotype of "A." corroyi Gaillard, 1939 is a tar-sometatarsus, which resembles the corresponding bone of extant kites (Milvus spp.) in its proportions. Because of the lack of overlap of skeletal elements, the affinities between these species cannot be established, and their classification in the same genus-level taxon (either "Aquila" as in the original descriptions or "Aquilavus" as per Brodkorb 1964) is conjectural. As first recognized by Mourer-Chauvire (see p. 110 in Olson 1985), the alleged cuculiform Dynamopterus boulei Gaillard, 1939 is a species of the Accipitridae, and may well be a junior synonym of A. corroyi, with which it corresponds in size. Palaeohierax gervaisii (Milne-Edwards, 1863) from the late Oligocene of France is also based on a tarsometatarsus and was nearly twice as large as the kite-sized A. corroyi. From the "middle" Oligocene of Mongolia, Kurochkin (1968b) described three species of putative Accipitridae as Buteo circoides Kurochkin, 1968 (distal ulna), Venerator ("Tutor") dementjevi (Kurochkin, 1968) (distal humerus), and Gobihierax edax Kurochkin, 1968 (fragmentary distal humerus). The former two species were assigned to the Buteoninae, the latter species to the Accipitrinae. Because of their fragmentary representation, identification of all of them needs to be verified with additional material. From the early Oligocene of Mongolia, Kurochkin (1976, p. 78) further mentioned "several rather large femora resembling the recent Aegypiinae ... in a number of important characteristics." Kurochkin (1976) also noted the presence of an accipitrid ("Aquilavus") in the late Oligocene (Indricotherium Beds) of Kazakhstan. A distal tarsometatarsus of a large accipitrid from the late Eocene of the Jebel Qatrani Formation (Fayum) in Egypt resembles that of modern eagles of the taxon Haliaeetus (Rasmussen et al. 1987). Several species of the Accipitridae were described from the Oligocene of North America. "Buteo" grangeri Wetmore and Case, 1934 and "B." fluviaticus Miller and Sibley, 1942 occur in the White River Formation of Colorado. The latter is based on a distal tarsometatarsus, whereas of the former only the skull is known; Miller and Sibley (1942) noted that these specimens may be from the same species. "B." antecursor Wetmore, 1933 from the early Oligocene Brule Formation of Wyoming is represented by a tarsometatarsus. Assignment of all of these species to the extant taxon Buteo is based on overall similarity, which may well be plesiomor-phic for the Accipitridae. Also from the early Oligocene (Poleslide Member of the Brule Formation) of Wyoming comes Palaeoplancus sternbergi Wetmore, 1933, the holotype of which consists of a partial skeleton including the skull. This roughly Osprey sized species is very close in its osteological features to modern Accipitridae, and judging from the published illustrations its tarsometatarsus resembles that of the similarly sized P gervaisii. P. sternbergi was classified in the monotypic taxon Palaeoplancinae by Wetmore (1933d). The species agrees with the Sagittariidae and Pandionidae but differs from all extant Accipitridae in the long and slender acromial process of the furcula, a presumably plesiomorphic feature which suggests a position outside crown group Accipitridae. On the basis of distal tarsometatarsi, three accipitrid species were described from the late Oligocene (early Arikareean) of Nebraska, i.e., "Geranoaetus" ales Wetmore, 1926, Palaeastur atavus Wetmore, 1943, and Promilio efferus (Wetmore, 1923) (see Brodkorb 1964). 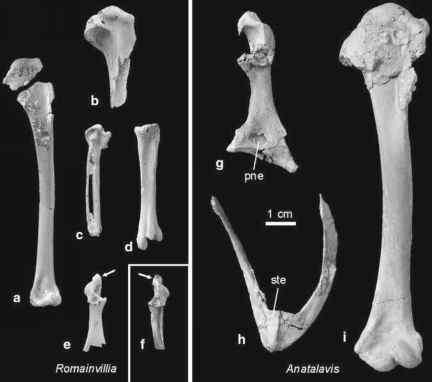 Agnolin (2006b) and earlier authors (e.g., Brodkorb 1964) assigned Climacarthrus incompletus Ameghino, 1899 from the late Oligocene (Deseadan) of the Santa Cruz Province in Argentina to the Accipitridae. The species is based on a very fragmentary and badly preserved distal tarsometatarsus, and its definite identification has to await the discovery of more complete specimens. The same is true for Cruschedula revola Ameghino, 1899, also from the Deseadan of Argentina, whose holotype is the cranial extremity of a scapula. C. revola was classified into the Cladornithidae (Sect. 16.11) by Ameghino (1899), but was assigned to the Accipitridae by Brodkorb (1964), Tonni (1980), and Agnolin (2006b). I do not consider it possible to reliably establish the phylogenetic affinities of this fragmentary bone. Pengana robertbolesi Boles, 1993 from the late Oligocene/early Miocene of Riversleigh in Australia is represented by a distal tibiotarsus. The specimen exhibits mediolaterally very narrow condyles, which permitted "a much greater degree of both anteriorposterior and mediolateral flexion than in other species of the Accipitridae" (Boles 1993, p. 19). Within extant Accipitridae a similar morphology is found in the South American Geranospiza and the African Polyboroides, which are, however, considerably smaller than Pengana. The two extant taxa are probably neither closely related to each other nor to the fossil taxon (Boles 1993), and use their feet to capture prey in hollows inaccessible to other predatory birds. Despite a presumed similar function of the intertarsal joint, the tibiotarsus of Pengana is very different from that of the Horusornithidae (Sect. 14.4) in, for example, the more accipitrid-like shape of the condyles and the presence of a supratendinal bridge.